Glass Holds Up To 13- 1/2 oz. 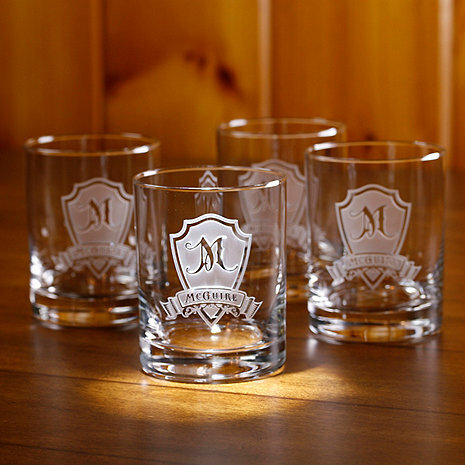 Our Personalized Shield Whiskey Glass Set is custom engraved with an old world european style shield featuring a monogram initial in the center and an elegant name banner engraved under the shield. Our custom scotch glass set is the perfect groomsmen gift, birthday or wedding gift. Our master glass carvers deeply carve each glass using our sand carving technique, so that each of our whiskey glasses is meticulously custom made to order making this the perfect gift for those seeking unique gift ideas for whiskey lovers. At 4.25" high x 3. "4 wide, our scotch glass hold 13.5 oz. Dishwasher safe. I would like to have an M on the top and two words - Clan MacGregor - on the bottom line. Is that possible? We did a R on top and our family name on the bottom. CPA MacGregor should work and look good. are these glasses crystal ? BEST ANSWER: No they are not, but the etching is done very well on the glasses. These are a high quality machine made glass. Will Line 2 of this item automatically be printed in all caps, or do I need to specify when I type it in the box? BEST ANSWER: Line 2 will be in all caps. I ordered these for my husband's birthday and I'm wondering if there's any possible way to get a decanter with similar engraving. Even with just the single initial in the same script. BEST ANSWER: Thank you for your question, they do not offer the same personalization on a decanter but we do carry multiple Whiskey Decanters that are personalized. Please contact our consultants at 800-356-8466 and they can provide more information. These glasses are beautiful and high quality. They make a great gift. I have ordered two different sets and have been very pleased with each set. Also, they arrived faster than I had expected. The Jury is still out on these glasses! The cut glass is not smooth enough, feel sharp to the tough, uncomfortable feeling. Very nicely etched, quality rocks glass with nice heavy feel. Very reasonably priced. Glad I bought them.